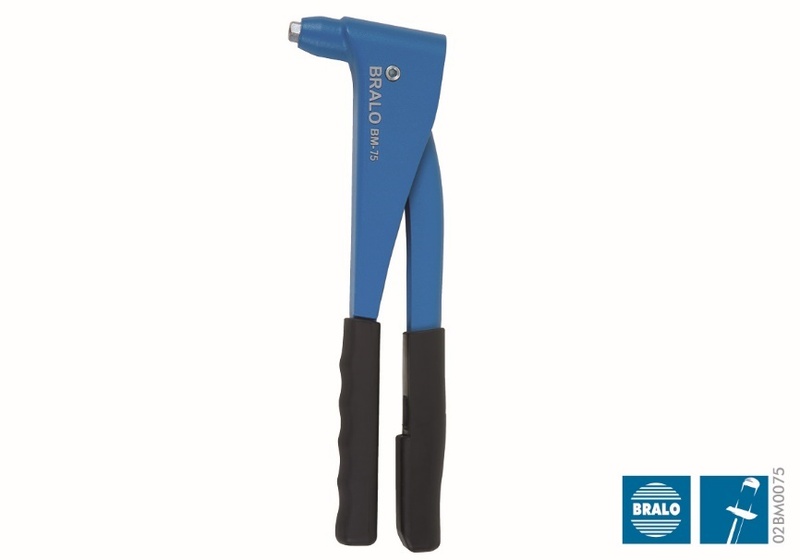 The Bralo BM-75 riveting tool is light, easy to use and maintain. It is an appropriate tool for construction, maintenance and repair of light work. All functions are contained in a length of 265 mm and a weight of 600 gr. For use both in and outdoors. Main body made in aluminium foundry. Riveting capacity of up to 5.0 mm. Light tempered steel lever. Slim design for access for difficult riveting places. Opening spring for quick ejection of the mandrel. Ergonomic handles facilitate the riveting process. Set nosepieces catcher and nosepiece spanner. Lightweight, low cost tool. The Bralo BM-75 riveter is available in different packages. It can be presented in a very practical blister pack-display for distribution or packaged in a protective box. It can also be presented in a plastic case that includes an assortment of the most common rivets.